Three Turkish soldiers have been killed in an attack on a convoy in the south-east by PKK (Kurdistan Workers Party) militants, the army says. Drones, helicopter gunships and commando units have been deployed to strike PKK positions, it said. Thursday's attack is the latest in an upsurge in violence, which began last week. Prior to that, there had been a two-year ceasefire between the two sides. The government says PKK attacks on Turkey have made peace attempts impossible. At the same time as launching attacks against the PKK in Iraq, the Turkish military also began air strikes against Islamic State (IS) targets in Syria. In Thursday's attack, a Turkish military statement said, Kurdish separatists opened fire on an army convoy in Sirnak province, killing three soldiers. It followed an assault blamed on militants in the mainly Kurdish city of Diyarbakir late on Wednesday, in which a Turkish police officer and a civilian passer-by sustained lethal wounds. Last Friday's airstrikes have prompted a renewal of open hostilities with the PKK, which wants greater independence from Ankara for Turkey's Kurdish minority. Turkish intelligence sources, cited by Hurriyet newspaper, say they believe as many as 190 PKK fighters have been killed - and 300 wounded - in airstrikes on Kurdish positions in the south east of the country and northern Iraq over the past week. 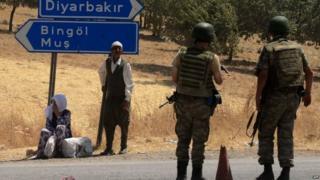 Thursday's attack on the convoy brings the total number of Turkish military and police killed in the last week to 11. Turkey's President, Recep Tayyip Erdogan, said on Tuesday there was no hope for peace between Ankara and the Kurds, as long as the militants kept attacking Turkish positions. He said it was "not possible to continue the peace process with those who threaten our national unity and brotherhood". The leader of Turkey's pro-Kurdish HDP party, Selahatting Demirtas, has denounced Ankara's attempts to establish a "safe zone" inside Syria, and said strikes on IS targets were a cover for attacking Kurdish positions.